Peruse the comments on Gabbard’s post and you’ll see some 20 thousand furious responses all more or less saying the same thing: we don’t know what Mueller reported. It’s a complete and total mystery. There could be anything in there. For all we know Barr lied about the whole thing. This lays out clearly where the victims of the Russiagate psyop are being herded in response to Mueller’s report. A few days ago when I would talk on social media about the fact that Don Jr and Jared Kushner aren’t being dragged off in chains as promised, there was deathly silence from the Russiagate crew. Now when I talk about it (check out the responses to this post just for an example), I get a bunch of responders going on about the fact that we haven’t seen the report, and that Barr’s letter only contains partial sentences from the report (as though there’s anything else that could be in those sentences which would change the meaning of “did not establish that members of the Trump Campaign conspired or coordinated with the Russian government in its election interference activities”). These are the arguments that the narrative managers have taught them to make. Of course, these arguments are absurd. 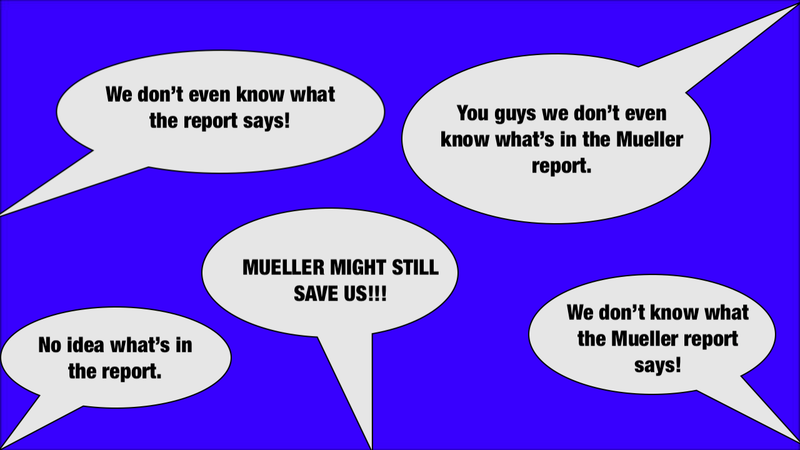 As other analysts have noted repeatedly, the belief that the full Mueller report contains shocking and incriminating evidence of Russian collusion is premised on the idea that Robert Mueller, the paragon of virtue and integrity according to these same people, is simply sitting on the sidelines allowing William Barr to lie about his investigation uncorrected. Mueller, who had no hesitation in coming out to correct BuzzFeed’s false reporting about a single aspect of the investigation in January, has not stepped forward to say that Barr has lied about his entire two-year investigation as they are claiming. There has not been so much as a single anonymous leak from anyone on his team to the Washington Post contradicting anything Barr’s said. Mueller made it clear with the BuzzFeed debacle that he will intervene to prevent disinformation about his investigation from tainting public discourse, but he has not done so with Barr’s letter, even after the investigation is over. This fact kills the argument that there might be some dramatic revelations about a Russian conspiracy in the report. Which of course means that by mid-April, if not sooner, Russiagaters will be subjected to yet another loud “told you so” victory lap from Russiagate skeptics like myself. And they will have brought it entirely upon themselves. The phrase deus ex machina comes from a common plot resolution technique in ancient Greek theater in which an actor playing a god (deus) was lowered onto the stage by a pulley system (machina) at the end of the play to save the day. The god would swoop in, rescue the heroes, mete out punishment to the villains, and deliver a monologue saying everything’s fine now. This is exactly what rank-and-file Russiagaters have been trained to expect from the Mueller report for the last two years. That it isn’t necessary to struggle to force major changes in the US political process and the Democratic Party or ask sober questions about how a reality TV star defeated “the most qualified candidate ever to run as president”, because any minute now Robert Mueller is going to be lowered onto the stage, arrest Trump’s whole corrupt inner circle, and hand Congress the evidence needed for his impeachment. The heroes would be vindicated, the villains punished, and none of the messy stuff in the beginning and middle of the play will have really mattered. Deus ex Mueller isn’t coming, my pussyhat-wearing friends. The report may contain some indications of corruption, because Trump’s circle is very corrupt, but there’s not going to be any revelation about a Russian conspiracy, and there won’t be any impeachment. The only way you’re going to get him out of office is by voting him out, which you greatly hurt your chances of doing by putting all your eggs in a basket that Trump will now be able to label an unfair “witch hunt” throughout his entire reelection campaign. You guys are not good egg-putters, Democrats. The fact that you put all your eggs in the basket of Robert “Weapons of Mass Destruction” Mueller bringing the Executive Branch of the US government to its knees is hilarious. And the fact that you’re now cramming all your eggs in the basket of the report being somehow a 180 degree switch from the summary that we’ve received already, thus setting you up for more ridicule when the full report is revealed, shows you just how bad at egg-putting you are. Stop waiting for deus ex Mueller. Take off the tinfoil pussyhats, stop pouring your energy into baseless conspiracy theories, and start building a real political movement. If you actually see Trump as a threat, this is the only sane basket to put your eggs in. I, for one, cannot wait to see what the Easter Bunny brings in mine.